If you own a feather bed then you will certainly appreciate the Feather Bed Cover with Zip Closure by Pacific Coast Feather for the protection they provide and how easy they make caring for your feather bed. The feather bed protector cover should be placed over the feather bed and under the fitted sheet. 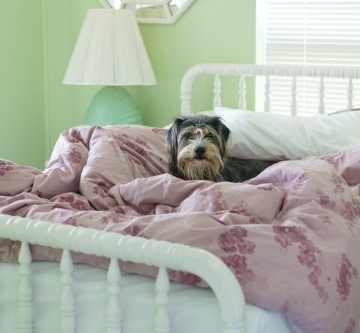 Make sure your sheets have deep pockets to accommodate the mattress, feather bed and cover. Your dog or cat should have come with a protective encasement but you'll have to settle on buying them for your bedding instead. Both yourself and your pet will be thankful you did. Sleep is an essential part of our everyday lives and keeping your bedding clean is a vital step to maintaining your health. Bedding protectors are easy to pull off and toss in the wash for fresh bedding without the hassle of cleaning your feather bed. If you own a feather bed or plan on owning one you NEED a cover to protect it. Once you start shopping online you will find that there is a vast selection of feather bed protectors available ranging in price anywhere around $30 and more. How much you spend depends on your sleeping preferences and needs. Fitted covers fit over the feather bed and mattress the same way a fitted sheet covers your mattress OR simply covers the top of the feather bed and hooks on to the mattress corners with elastics providing less protection than an encasement type of cover. Encasement covers fit over the feather bed much like a pillow case over a pillow. Different types of closures are button, snaps, Velcro, and zipper. Zipper closed encasement covers offer the most allergy protection against dust mites. Fabric used to make most bedding protectors are either cotton, polyester, or wool. Cambric and Egyptian are top of the line cottons. Feel dust free but also chemical free with hypo allergenic, organic cotton feather bed covers. Hot sleepers should use a breathable - membrane free protector. They are most comfortable to sleep on and offer a level of absorbency sufficient for those without pets or who do not suffer from bed wetting. Return from this Feather Bed Covers page to the Down Bedding Delights home page.